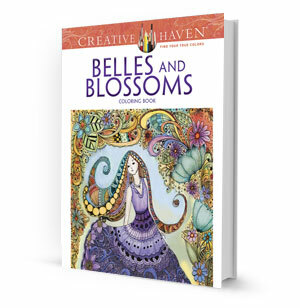 This latest addition to Dover's Creative Haven series for the experienced colorist is comprised of innovative designs in series of exquisitely rendered coloring plates. Thirty-one imaginative motifs pair abundant floral borders with lovely ladies in elegant presentations. Bring them to life by infusing them with color, and you will enjoy many hours of creative fun. The perforated, unbacked pages will allow you to experiment with any media you like, and make displaying finished work easy! Thirty-one beautifully intricate flower designs are paired with delicate female faces and figures, and more!